I think something has gone wrong with the BIOS of my modchip and the original XBOX bios. Essentially, the modchip boot times out and then loads the original BIOS before displaying error 21 with a flashing green eject light. If I try and use HeXeN, the console suddenly resets after Linux appears on the splash screen. At the same time, the eject light flashes red before the reboot into the original BIOS. It's really sudden - like it sounds like the console is stopped dead. I have tried a new hard drive and the same thing happens, except for an error 13 flag due to the new hard drive not being setup properly. I accidentally changed the video output settings to NTSC-J and reset. The next load, the console started with weird colours on screen before erroring out. Fixable, if I could get anything to load. Let me say first that chips and BIOS are not my thing. Despite having used a chipped Xbox since 2005 I've never flashed a BIOS and until recently did not even know what BIOS my Xecuter 2.6 was using. But what I do know is that if the chip was installed correctly then a suitably burned HeXEn disc should at least cold boot. Assuming this is a new chip install and the machine has not worked properly since the chip was fitted then a fault with that I'd think was most likely. However you may be lucky as the behaviour would also fit if the HeXEn disc was not burned to DVD-R. Depending on your disc drive type, there's a good chance that is the cause of the problem getting the disc to boot. 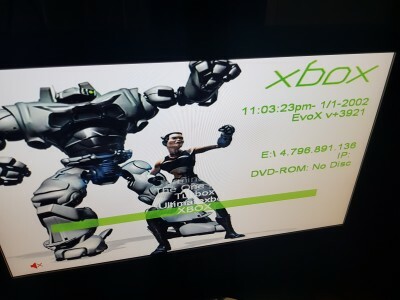 DVD-R is the only disc media all Xbox drive types like so re-burn on DVD-R preferably using ImgBurn at its default "Write image file to disc" (ISO) settings. BTW for whatever reason Heimdall and I think also the guy who updated HeXEn a couple of years ago left HeXEn's default XBE name as "Linux" which is why you see that on the loading screen. When using HeXEn the front LED will flash red throughout. It is entirely normal and done as a warning reminder that you're using a powerful tool that could brick your Xbox if not used correctly. HeXEn also will take some time to load, there is always a delay between the loading screen and the disc actually booting of about 20 seconds. 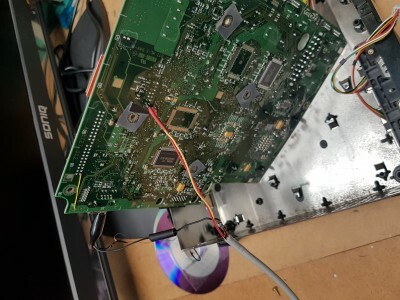 The modchip has been in the console for 15 years. No issues there, at least with the install anyway. I'm using good Ritek DVD-R discs in the Thomson XBOX drive and have used ImgBurn. As for loading HeXEn, as soon as the disc is recognised, the console actually turns off and then cold boots into the standard XBOX bios before erroring out. The eject light doesn't stay red. It flashes red once and then reboots. That's why I uploaded the videos, as I haven't seen this issue elsewhere. It actually does this as well with Slayer and AIDeluxe. So, at present, every recovery tool is recognised by the console/chip, but then the console reboots straight away afterwards. I couldn't access the videos, I get an error message when I try so I was just going by your description here. I suppose it could be an unlucky coincidence that the Thomson drive has decided to act up at the same time as what might be a BIOS error. BTW can you cold boot original Xbox games' discs? Edit: this sounds like a bad dvd drive going out also check your Caps by the cpu and gpu and also if you still have a clock cap in you might want to check if that has caused any damage. I would burn the game on imgburn at 4x if you can i know people say it dont matter but i never ever have issues like everyone else when it comes to loading the disc unless its a bad dvd drive. now that is out of the way when you are loading hexen your led light will turn red let it load it can take up to a min sometimes on some even heard 2-3 mins depending on your dvd drive lol but atleast give it that much time if you have a spare xbox laying around that you know the dvd drive is good stick it in there and see if the disc loads. Since it says "Microsoft" under the big X logo on startup either time you are not booting the BIOS from the modchip. I don't know of any hacked BIOS that didn't print something different there. I think the Aladdin Advance chip requires a LOOONG press of the power button (1 - 2 seconds) to enable the chip. And, an even longer (~5 seconds) to disable flash protection so you can reflash the chip with a newer BIOS. From what I understand, you can no longer start a replacement dashboard. 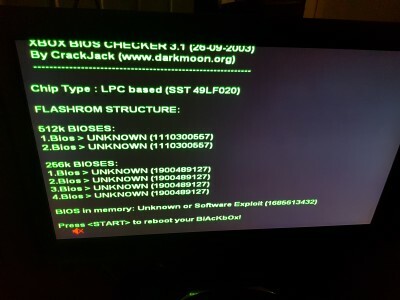 How'd you get the BIOS Checker screen capture? If you can, install the 5.0 version and capture its output. The old 3.1 version doesn't print the MD5 hash in hex but decimal which is not the format most BIOS ID lists use for these values. Which replacement dashboard are you using? Or, were you if it no longer boots? Most have the kernel version number somewhere in their skin if so configured or settings/system info pages. What is it? I concur with most of this too. That's why I asked whether stewielives can (cold) boot original games' disc - if there is a problem with doing that or not would be a good indication of the condition of his DVD drive. We're apparently talking about a system that was working for years but is now producing these errors. It sounds more like a hardware/component failure than BIOS. He has not touched the BIOS as far as we know so why would it suddenly corrupt? BTW I did some quite extensive disc media tests a few years ago, testing and re-testing with at least three different burns and two examples of every drive except the Philips and Thomson. DVD+R indeed proved almost as compatible as DVD-R with the exception of the Philips drive. It was also the only media I used which produced differences in results when using burning software other than ImgBurn. I always burn at the lowest supported speed (x4 for DVD-R/+R) too but my tests showed that speed was rarely made a difference. In fact in one case, the Philips drive, I found discs I'd burned at x10 worked whilst those at x4 did not. DVD-RW also proved surprisingly compatible all drives apart from the Philips and Samsung F worked fine with it. I have used and reused DVD-RW with my two Hitachi disc drive Xboxes many times and its saved me significant money which I would have spent on single use DVD-R. It is CD-R that is the least compatible media, only the Samsung B drives like it. Surprisingly though CD-RW proved good for many drives but also produced one of the few inconsistencies in my results: one of my Samsung F drives refused to work with it but the other worked 100%. This has given me things to try. I'm still not having luck, but have been able to experience a couple of new issues - so changes. I take all the points about DVD media on board, but the most serious issue here is that once HeXEn (or AID or Slayer) is recognised, the console shuts down completely (not a soft reset) before cold booting into the original BIOS. I'm not sure how sketchy media could cause this. It's like the chip is sending an off command. Also, why I think it's the BIOS? Because this happened immediately after I (stupidly) changed the output setting of the console in XBMP to 720p NTSC-J. The very next load this happened. 1. I tried Halo 2 to see if I would have any love there. No luck with original BIOS, but an original Halo 2 disc will actually stop the modchip reset. I just stays on the modded XBOX splash screen with Microsoft displaying. 2. One particular burn of HeXEn 2017 will pop up with Linux, and instead of turning the console off like the other discs, the disc will search for a bit before the eject light flashes orange and red and error 14 displays. I'm almost certain that it's the v32 Aladdin, so it's a very simple setup. No flash protection. The bios screen captures came from when the console worked properly. I'm attached a screen cap of the dashboard - EvoX v+3921. Clock cap is slightly swollen. It had a tiny bit of blue on top of it, but it has not leaked everywhere. All other caps are fine. I'm pretty sure that Microsoft displayed on the hacked BIOS screen even when the console was working. I never had that big EvoX logo on the animation that other people have. Also, you can't see it from the video because the screen colours are off, but the XBOX logo is actually dark blue. Front panel eject ring flashing 50% red/50% orange indicates a RAM error. Same thing as above (error 13). This time it is also a little mistake from you on changing names or having played around with files on the xbox harddisk. Error 14 is most often because you changed boot orders or names of startup files on the harddisk. It can also happen when you are rebuilding your xbox harddisk with a slayer cd and the power was cut. Hard to ID it from the output of BIOS Checker as it's a color modded BIOS. The user changing the color settings has to keep track of the MD5 hash (not what BIOS Checker 3.1's displaying ) and add it to the biosids.txt file. 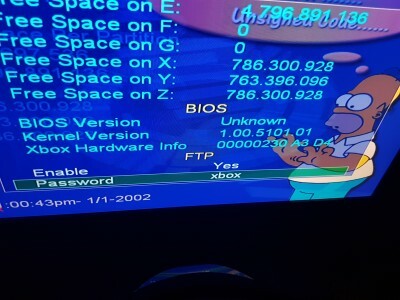 Ah, the Evox BIOS shows Microsoft under the big X log but generally has the purple EvoX shield displayed in the upper left corner during the flubber animation; however, it can be turned off in the BIOS modding app EVTool. The kernel version would help if the Evoxdash skin showed it. Some do, some don't. Kernel version is attached for anyone interested. Just a final word on this, as I couldn't get the console going again. Thanks to all those who offered advice. I acquired another XBOX (1.4 TSOP flashed). I put the old HDD in that console and it errored out - no dashboard files. So, something went wrong with my HDD. I tried HeXEn and other recovery software with the old HDD in the new console, and while the red light would come on, HeXEn would never load. The newer console's HDD in the old console does not work either. I think my problem is two-fold. Either way, I'm giving up and will use the old console for donor parts. 1. The Aladdin v32 BIOS is stuffed. This is why the console turns off and then cold boots into the stock BIOS whenever HeXEn is inserted. 2. The dashboard files on the HDD are either missing or corrupted. This is why the stock dashboard does not load once the console cold boots following the modchip crash. I've learned a lot through this process. Shame I can't make any more progress. 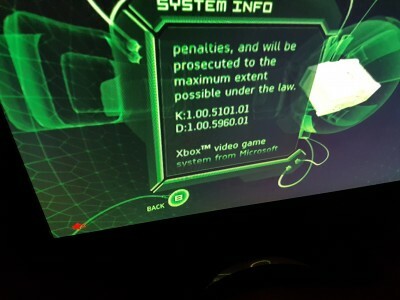 If the HDD is locked, you can't use it in a different Xbox. You'll receive an error since data cannot be accessed on the HDD to load the dashboard. Generally - Error 6 - Cannot unlock HDD. 5101 is a stock MS BIOS version. I'm not sure which hacked BIOS also used that same version number. Maybe an older Evox BIOS as their latest release, m8plus, which is based on the MS BIOS 5838 also displays the kernel version 5838. I fixed it. Thought I’d post the solution. Solution involves making an EEPROM reader and uploading a new .bin file to the EEPROM. I can promise that I tried absolutely everything before this. So, the original fault as described was the problem, and not something else. BIOS files on modchip and stock TSOP were fine. I guess this is a note of caution to anyone playing around with video modes using anything other than Enigmah, as these are ultimately written to the EEPROM. As best as I can tell, when that particular version of XBMC changed the video output to NTSC-J, it caused a problem with the EEPROM which prevented anything from loading. At the same time, something happened to the stock MS dashboard files – I’m not sure if these two things are related. I tried everything suggested, plus lots of other things, all to no avail. I even fried the original HDD when trying to do a swap using XBOXHDM. 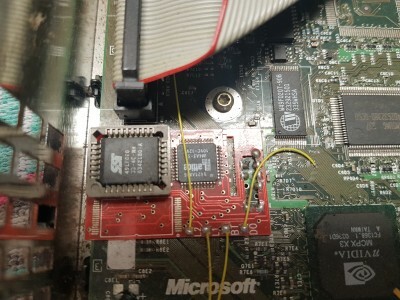 I initially tried reading the EEPROM from a working XBOX with a USB to Serial converter on 64 bit, Windows 10. No good. In the end, I had to get an old PC out of storage that had built in serial ports. 32 bit, Windows 7. Here’s some specifics in terms of my connection, as I cannot find guides that cover these areas online. -	I removed the HDD and the DVD drive. -	I removed the IDE cable and DVD drive power cable from the motherboard. -	My modchip was covering the header holes, so I had to flip the board. -	I unplugged the cable for controllers 1 and 2 from the motherboard. I flipped the board on its side (picture attached). -	I attached the earth alligator clip to the side of the ethernet port. -	I attached the EEPROM reader cables to the underside of the motherboard (reversed from Slot1Gamer’s guide, of course). -	With all cables attached, and with the reader plugged into the PC, I turned on the XBOX. -	I didn’t get flashing orange lights like in Slot1Gamer’s video – mine were flashing green. I had to turn the console off at the power though. The front buttons would not work. Side note – man, these old motherboards are resilient. On my first attempt with the working console, I plugged the earth pin into the 3.3V header. The cable caught on fire and disintegrated before my eyes. That console still works. Wow. In terms of reading the EEPROM on the old PC, everything went like clockwork. I read the EEPROM and saved it as a .bin file. When I went to open it in LiveInfo, I kept getting an error stating that the video and XBE region were incorrect. Using LiveInfo, I changed the video and XBE region to PAL Australia (which is where the console is from) from the weird NTSC setting that it was set as, and then saved it as a new .bin file. I went back into PonyProg and wrote the new .bin file to the EEPROM as per Slot1Gamer’s guide. I put everything back together and turned the console on. All of a sudden, HeXEn would load again and the colours were back to normal. From there, it was just a matter of using HeXEn and its utilities to make a new HDD (which I was going to do anyway), and the console is now working again. Thanks to all who helped with suggestions.